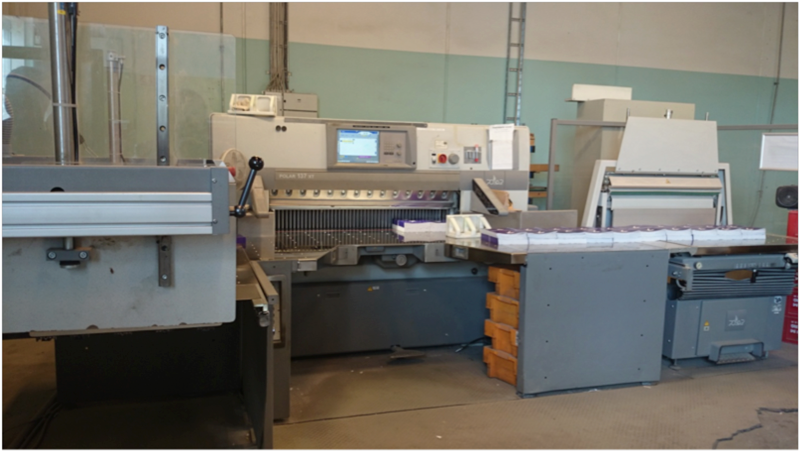 Sheet cutting is an indispensable activity in the sheet-fed digital and offset printing processes. Sheet cutting is one of the most labor intensive activities in the total printing process, because it includes a lot of manual lifting and transportation of sheets. The typical sheet cutter operator handles 1½-2 standard 40” (70*100 cm) pallets per hour, which corresponds to between 1 and 1½ tons of materials per hour. The conventional way to increase the production capacity of a sheet cutter line is to add an extra operator, which increases the production capacity significantly, depending on the type of cutting jobs. But adding an extra operator does not have any impact on the operators’ productivity – and it is the increased productivity, which is the key to increased profitability. The productivity of the operators at manually operated sheet cutters can only be increased by automating the sheet lifting and transportation. This roughly doubles the production capacity of the conventional sheet cutter line, and as the line is operated by one- instead of two operators, the productivity of any professional sheet cutter operator doubles. Yaskawa Levanto is a highly productive robotic solution for lifting stack of sheets from a pallet to a vibration table and Yaskawa Levanto’s optional stack transportation system automates the transport from the vibration table to the sheet cutter. A smart way to increase both production capacity and operator productivity is to install two sheet cutters in a tandem configuration, so one cutter cuts in one direction, while the other cuts in the other. This eliminates the time consumption for turning the stack of sheets between cuttings in two different directions, and it makes it possible to process one stack of sheets much faster.